Birthdays are always special.Whether it is you who are celebrating or someone close to you.I always looked forward to that special day in my life every year[I am sure most of us do:)].In school,where we were permitted to wear ‘colour dress’ while everyone else wore the boring uniforms,preparations started almost months back.As to what I would wear to who will accompany me to distribute chocolates.Shopping was done usually the previous day,lest I change my mind later:).Little tricks that amma learnt. Amma always woke me up with a kiss and her birthday wish.Then it was appa’s turn and then my bro’s.Now of course,the baton has turned to Ajay.He has to[yup,its compulsory,lol] wish me at midnight and has to[:)] wish me throughout the day.Gifts would be chosen much beforehand,he just has to buy it for me..afterall,its my birthday:).He feels I would grow out of it after sometime,hah wishful thinking my dear. Had a fantastic birthday this year too.Thank you all for wishing me through mails,phone calls,sms's and messages on Facebook and Orkut.Love you all,you just made me day extra special. Made a simple Chocolate cake[Eggless] and that’s all the cooking I did.Ajay took me out the whole day not letting me do any cooking.We cut the cake in the evening with friends and then later ordered Pizza.Hmm,back to the grind from today..why don’t the birthdays come twice every year;). Grease and line the bottom of a 9” round cake tin with greaseproof paper/baking parchment/butter paper.I used a heart shaped tin. Preheat the oven at about 100 to 120 degrees centigrade. Sift together the flour, cocoa powder, baking powder and baking soda. In a mixing bowl,add the sifted flour mixture and make a well in the center. Add in the condensed milk, melted butter, vanilla essence and water. Beat with an electric hand mixer, whisk or spoon just until the mixture is uniform and smooth and there are no lumps.Take care not to overbeat as this tends to make the texture of the cake hard. Pour the batter into the cake tin and bake for an hour at 150 degree centigrade. Mix together everything in a bowl and beat with a wooden spoon till smooth. If the mix is too thick,you could add a few tbsp milk to ‘loosen’ it,but add only if required. 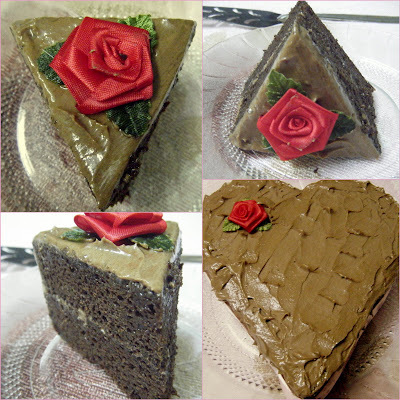 Level the top part of the cake with a serrated knife and the cut the cake into 2 or 3 horizontally[I cut into 2]. Fill and cover with the icing. Wish you a very happy birthday dear. 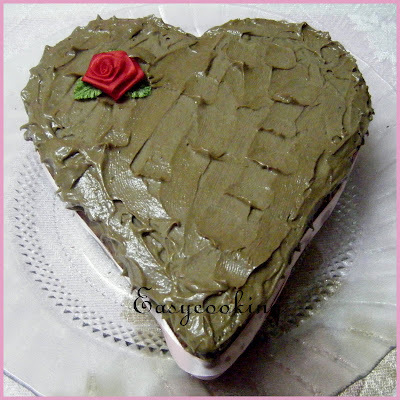 Such a beautiful heart shaped chocolate cake DIvya..Excellent cake to celebrate dear..Seems u had a wonderful time.. In ourschool too we were only allowed to wear colour dress during our b'days. that's a gorgeous chocolate delight!!! My belated wishes birthday wishes !!! I'm totally yes when you say about the uniform and the colour dres, the gifts etc.... nice souvenirs of the carefree days!!! "I always looked forward to that special day in my life every year[I am sure most of us do:)]" hummmmm, not me, but this depends on how many years old are we!!! :):) personally, I don't even want the next year to come :):):) have a nice day!!! Glad to know you had a fabulous day, Dhivya! :)..
BTW, which brand cocoa powder did you use?..the colour is good! The post took me to my school days..waiting to wear the color dress..Hahha..all memories to pamper...Belated birthday wishes dea..
Its eggless! :D Mandalam maasam yet I can bake this one...made the previous one frm u several times ! Tks for sharing n great to know abt how chweet ur bday went..n yes..pls DONOT grow up :D (I haven't in this regards..NEW dress tantrums, chocolates n advanced thrill abt upcoming event..ah..bliss! :D) Hugs. Happy Birthday, divya. Your birthday cake looks divine indeed. Birthday will show how many dear and near still remember us :) Looks pretty ur cake! Happy Birthday Divya! Chocolate cake is the best way to celebrate birthdays especially when its your own! Hope you have another wonderful year ahead! Happy Birthday to you! God bless you with a happy, healthy and long life. Sorryy! I'm so late! Happy Belated Birthday!! 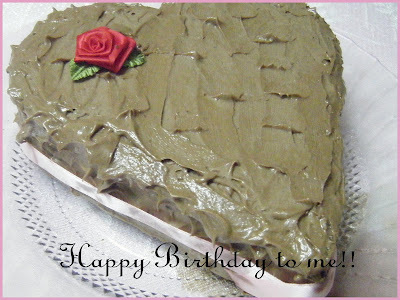 Seems to me like you had an amazing one, so well planned :P The cake looks delicious, I'm a fan of anything heart-shaped! Divu, just too good --made this eggless wonder for a frnds dad visiting her, his bday surprise at 12 midnight and they all liked it a lot! Tks ..wot works for u, happens to work out best for me! :) Photo coming up in next mail to u. :)Thankyou, thankyou..Divine Taste tks for posting this as well! Green Peas Masala ~ Thattukada Style! !